Is Uber Wheelchair Ride Program Sustainable? Late last week Uber rolled out their much anticipated accessible ride program in Washington DC. As their press release touts, this new option enables riders to request a wheelchair-accessible vehicle on-demand. And you can use the Uber app to order one in a matter of seconds. What could be better — an affordable wheelchair-accessible ride dispatched to you with a few swipes and a tap? On the surface it seems like a very inclusive solution, but is it really sustainable? The problem is that Uber is partnering with Washington DC taxi companies — the very companies that they are trying to drive out of business — to provide the accessible rides. So what will happen when the taxi companies start to fold? Who will Uber turn to then to provide those accessible rides? 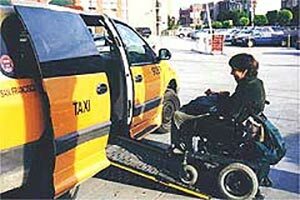 Unfortunately, as Carol Tyson, Director of Disability Policy at United Spinal Association points out, “Current demand for accessible taxi service in the District far exceeds supply.” This isn’t a unique problem, but it seems in this day and age we should be able to solve it. So for now, I’ll give Uber a thumbs-up for at least finding a creative way for wheelchair-users to use their service. But I agree with the folks at United Spinal — it’s not a long term solution. I applaud Uber for taking the first step, but I hope they are working on a sustainable solution as I write these words. After all, the clock is ticking, and if something isn’t done now, we could end up with no accessible transportation options in Washington DC — and other cities that Uber serves. This entry was posted in Editorial, Ground Transportation and tagged app, ground transportation, taxi, Uber, United spinal, Washington DC, wheelchair by Candy B. Harrington. Bookmark the permalink.